Heat the oil in a large saucepan; cook the onion, chillies and ginger for 2 minutes. Add the mushrooms and cook for 3 minutes, stirring occasionally. Add the stock, lemon grass and rice wine or white wine vinegar. Bring to the boil and simmer for 10-12 minutes. 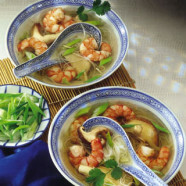 Add the prawns, coriander and noodles, bring to the boil; reduce the heat and simmer for 3-4 minutes.